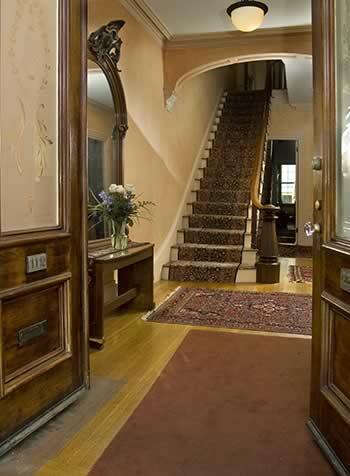 Step back into another era as you walk through the doors of our lovely and historic Italianate Victorian bed and breakfast in Cambridge, Massachusetts. This historic home has been meticulously and lovingly restored to its original glory, smartly mingled with 21st century comfort. Period details abound, from classic archways to marble fireplaces and cut-glass windows. The inn is elegantly, yet comfortably, furnished with eclectic antiques, original fine art, oriental rugs, and authentic lace curtains made on 19th century looms in Scotland. The inn’s atmosphere is refined and tasteful without being pretentious. 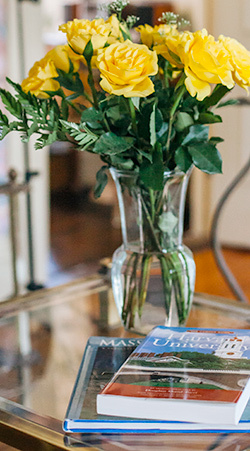 Prospect Place offers you a unique taste of the past – Victorian elegance with the modern amenities you require. For your comfort and convenience, we offer a smoke free environment with central air conditioning and complimentary Wifi internet. We welcome well-behaved children 9 years and older. We take pride in using only natural cleaning products and solutions throughout our vintage home, thus contributing to a more green environment. Please call us as soon as possible if you must cancel your stay with us. We realize that things do happen and plans do change. Should you need to cancel all or part of a reservation, we must receive notice no less than fourteen (14) days prior to your scheduled arrival date. For cancellations of all or partial reservations received less than fourteen (14) days prior to your current arrival date, you will be charged a minimum cancellation fee of one night’s lodging unless all nights are rebooked. Reservations paid for with gift certificates are subject to the same cancellation policy. Early departures/late arrivals are considered cancellations and are subject to the same cancellation policies. We booked 7 nights in the Florence Room at this lovely Victorian …very reasonable. It is an excellent place to stay and many guests that we met were not staying there for the first time. The location is superb,. steps away from the subway (T) – red line. Close to many restaurants. This is a place you choose to go to over and over again. We recommend it highly. We couldn’t have picked a better place! We especially loved being downstairs tucked away from the rest of the house in the Charles Suite. Very nice! One of the nicest rooms I’ve ever paid for. Breakfast was delicious and the kindness of the owners cannot be explained using words. Absolutely wonderful hosts. They made me feel like family, as I was a solo traveler to Boston during the July 4th festivities. The Madeline room was very comfortable for the 9 nights I was there. Breakfast was delicious, every morning. I didn’t need a car the entire trip, as the T was only blocks away. An unforgettable experience in Boston/Cambridge.